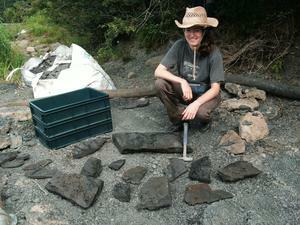 I’m Carys, a geologist at the University of Leicester, working on a research project to do with the evolution of tetrapods (the first large animals on land) in the Carboniferous, 350 million years ago - Tetrapod World. In my spare time I help to run Leicestershire Vegetarian and Vegan Group. We do a lot of local outreach and education about plant-based foods, such as cookery demos, talks, stalls and events like Leicester Vegan Fayre. Recently we launched a new Veggie Tourism initiative in Leicester. I’m a busy person with lots of hobbies and interests, so my favourite dishes are one’s I can cook in a hurry! Stir-fry’s, soups and salads. I also love winter comfort food like stews, pies and casseroles. I like to eat a lot of fruit for breakfast, to rehydrate and re-energise, so I have a juice or smoothie. On mornings where there is no time I have some toast or eat musseli when I get to work! I love avocado! Cant get enough of it. I don’t miss any foods, but like vegan alternatives to creamy cheese sauces such as cashew cheese or creme cheese made with almonds. I just like to eat a lot of fruit and vegetables, and I feel run down when I’ve eaten too much processed or junk food. They have the most nutrients and health benefits. I also like to eat carbohydrate and protein rich meals after going to the gym or exercising, and this is really easy to do eating plant-based. Its hard to say because I’ve been vegan for so long, but compared to meat-eaters I go climbing and mountain biking with, I’m at a better fitness level. It’s been the best decision I ever made! Now I can sleep at night with a clear conscience. By campaigning for animals and helping others go plant-based it gives me hope for the future. My advice is that it’s way, way cheaper than you think, and easier! Google, check out blogs, go to meetings, veggie restaurants, events etc. Try new things, and before you know it you have a new start in life that will benefit you, the animals and the whole planet.